The Rhake pack has a roll top giving it a decent degree of expansion. 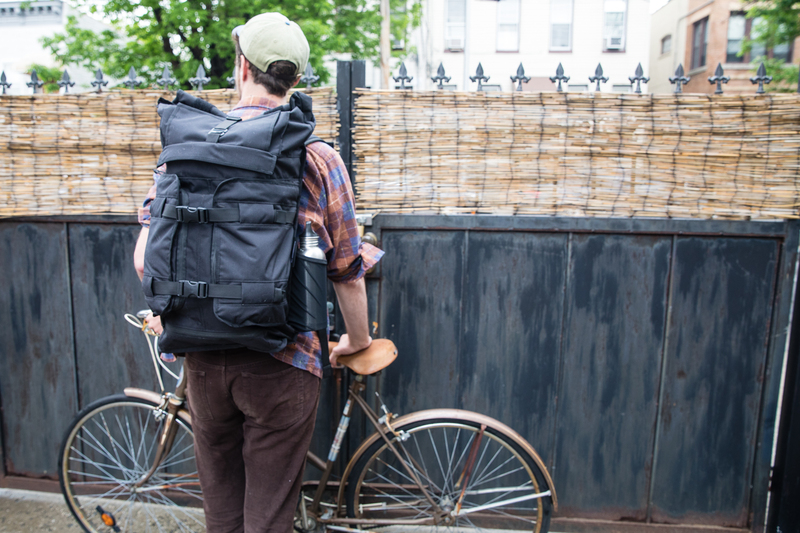 The Rhake waterproof backpack by Mission Workshops doesn’t look like an ordinary camera bag – instead it looks a lot more like a high quality bike messenger pack or something you might take on a weekend trip when packing light. And that’s the point. The bag’s 22L main compartment is designed to be multi-functional. Once you slide the Capsule Camera insert ($130) into the Rhake you have a camera bag with a utilitarian design, albeit with a very high price tag. 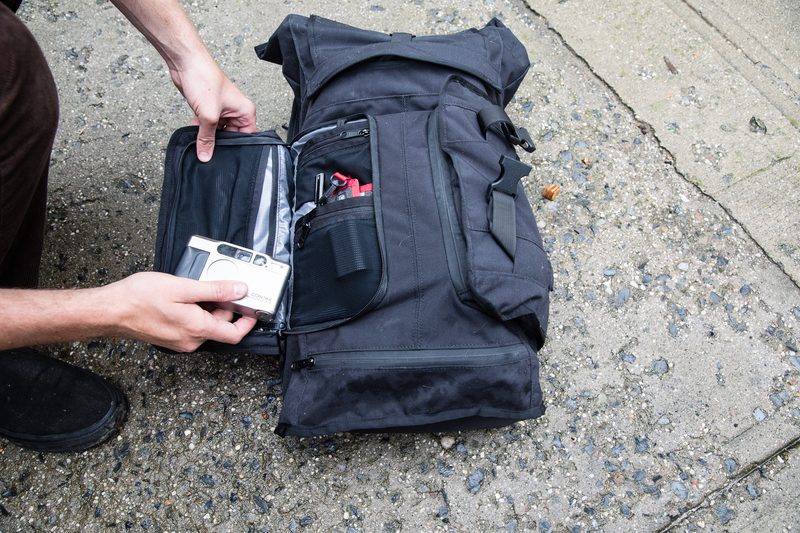 The Capsule Camera insert that slides into the Rhake pack. 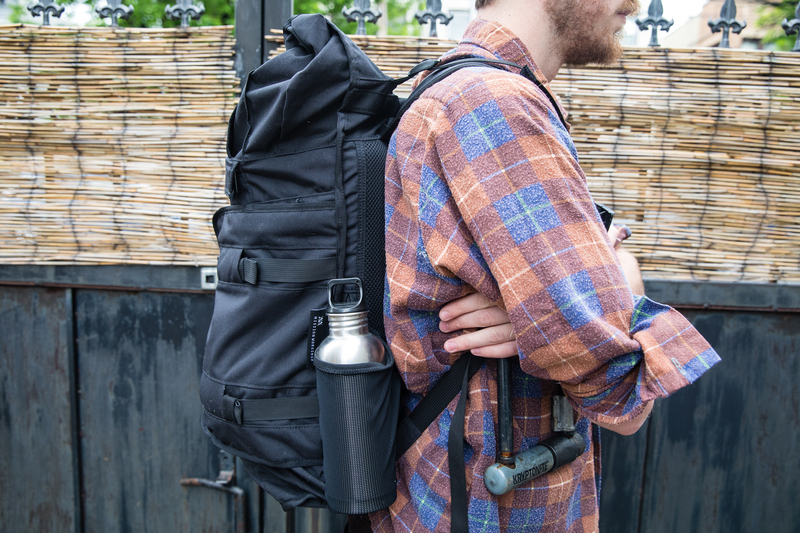 Though this pack is not designed specifically with photographers in mind, I was intrigued to find out just how functional it could be. The first thing I noticed about the Rhake was the high quality construction – Mission Design guarantees their products for life – which makes me believe that this thing was built to last. The bag is made of weatherproof nylon fabric called HT500 that is apparently exclusive to the company. It gives the pack an understated look and a good degree of water and stain resistance. 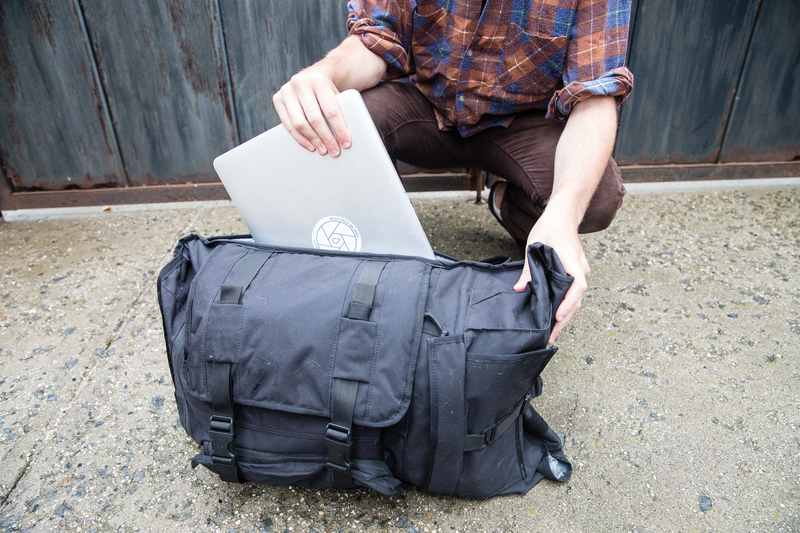 The Rhake pack’s laptop compartment can fit up to a 17″ computer. 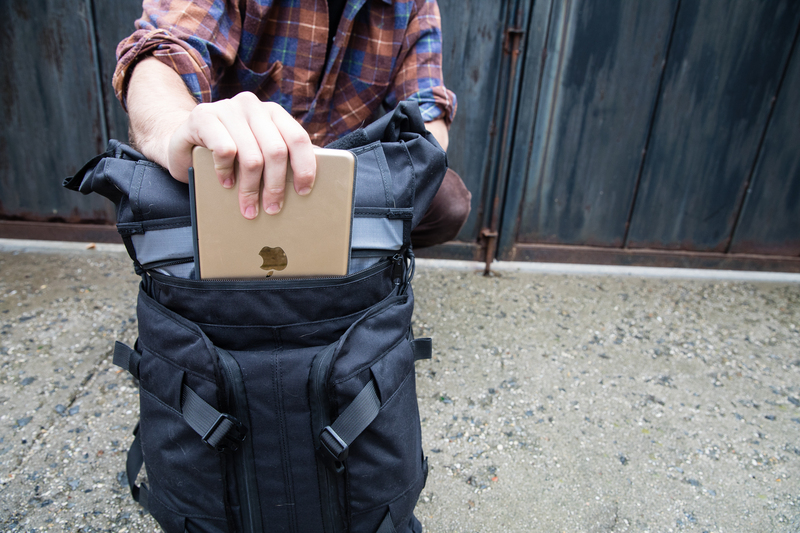 The pack also has a dedicated tablet compartment. The second thing I noticed about this bag was the amount of organizational pockets. 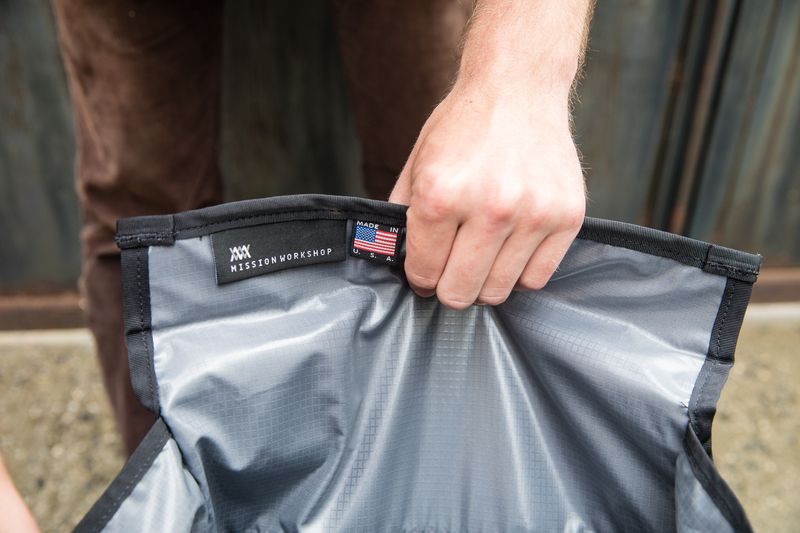 There are technically two zippered compartments that are large enough to fit a laptop (a dedicated exterior pocket, shown above left, and a second one within the 22L main compartment). On the back of the bag, opposite the exterior laptop pocket, there is a mesh water bottle pocket that tucks away when not in use. 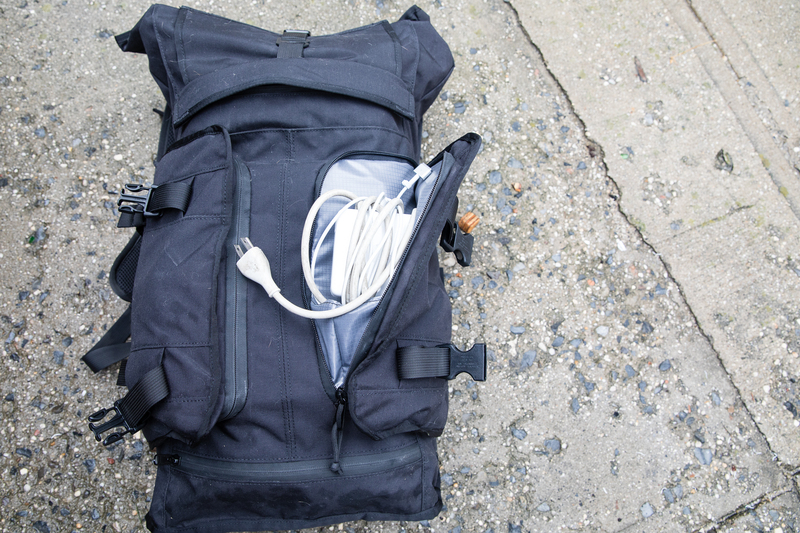 The front of the Rhake features a dedicated 10” tablet pocket and two accessory pouches (one at the top of the bag and one at the bottom) for stashing chargers, spare batteries or other items that need to be accessed quickly. There are two zippered front pockets with plenty of room to organize smaller odds and ends. There are also two accessory pouches, one at the top (accessible via the roll top) – and one at the bottom (accessible via zipper). There are also two larger zippered front pockets, one of which is filled with three smaller interior zippered mesh pockets. In short, there are numerous options for organization within this bag to suit your tastes. The straps are well-padded and a horizontal strap offers added stability. The back of the Rhake is made of perforated foam and there is a luggage handle pass-through for use with roller bags. The straps have a nice amount of padding and feature an additional horizontal buckled strap. The camera insert can be accessed from the top of the bag. A look inside the Rhake pack once the camera insert has been removed. The Camera Capsule insert is accessed from the top of the Rhake pack. The inside can be customized to your taste using the padded partitions. There’s also a back pocket in the insert where you can slide in an 11″ laptop or tablet. A close-up look inside the Camera Capsule insert. I was able to fit two bodies, several lenses and a flash. All of my photographer friends who saw the Rhake in action immediately complimented the style of this bag. It looks good, and it can comfortably hold a large amount of gear. I loved the many organizational pockets and those tiny mesh interiors were a great place for all of my miscellaneous items that I end up with at a shoot. 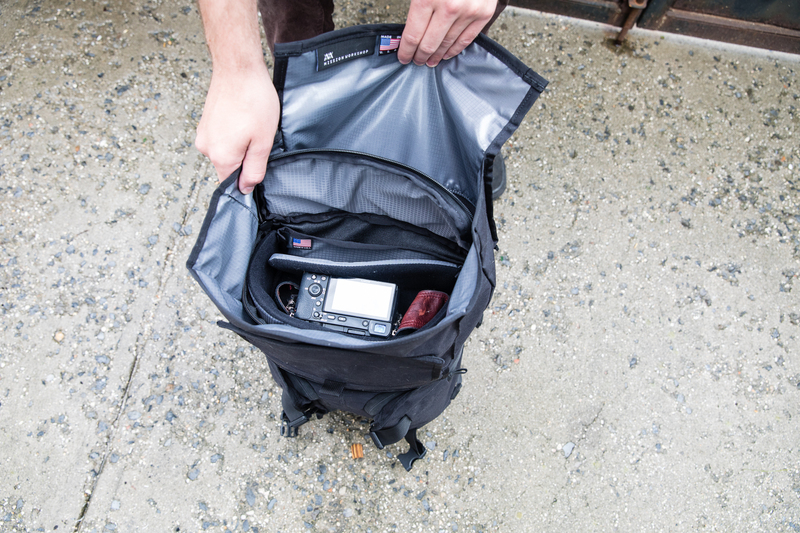 Once it’s packed, the front is snapped together and the top rolled shut, the Rhake pack is a surprisingly compact gear bag with the ability to expand to hold a large amount of equipment. Its compact silhouette made it a good for riding the subway (even during rush hour) and hauling it around didn’t make me feel like I was in danger of destroying a shoulder. 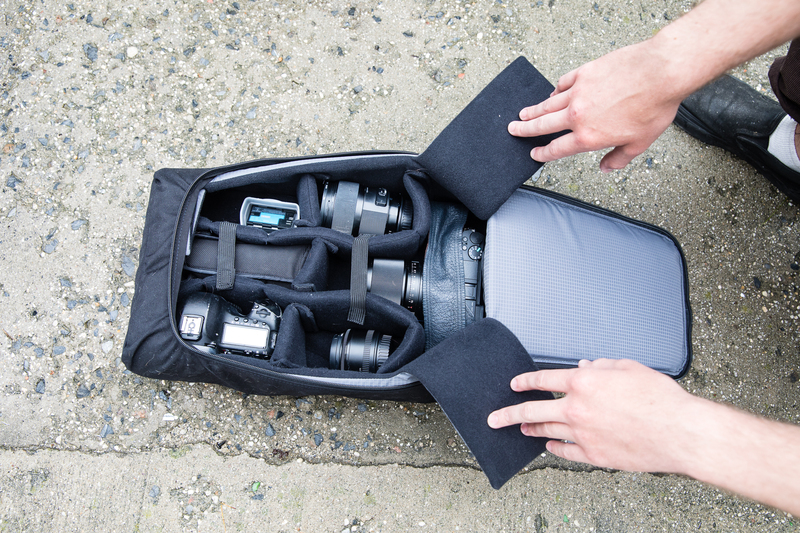 Unfortunately, there is one glaring design flaw with the Rhake: there’s no way to access most of the gear stored within the Camera Capsule insert unless you completely remove it from the bag. For some photographers, this might seem like a minor oversight; after all the Rhake is a multi-functional bag, but I found this design element to be really inconvenient. It was easy enough to access my main camera body through the top zipper, but if I wanted to switch lenses I needed to totally unpack the 22L compartment – which is kind of a pain when working in the cramped quarters of a dark music venue. When the bag is fully packed it also takes a little bit of elbow grease to remove the Camera Capsule from the main compartment. I imagine that with more use the bag’s structure will become less tight, but on the shoots I took the Rhake to I found myself having to spend a few extra moments safely removing the capsule from the bag. 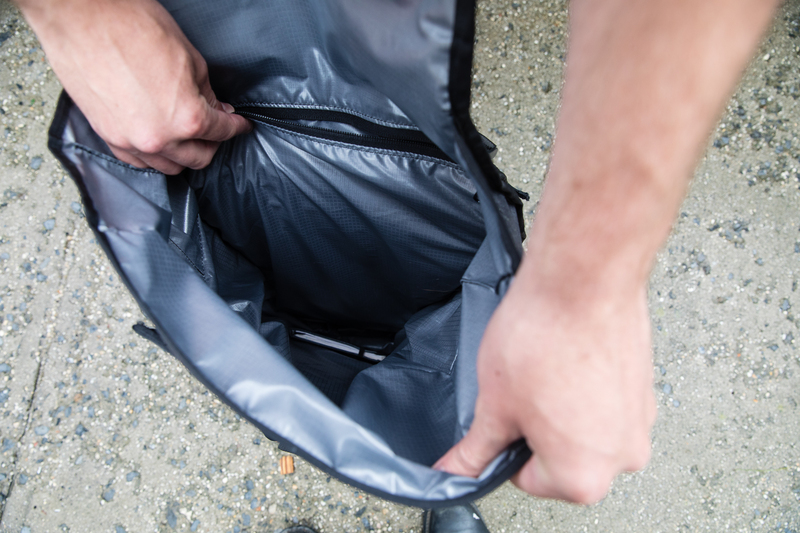 The Camera Capsule essentially fills the 22L compartment, making it difficult to stash anything else in there (a jacket, supplies for an overnight trip, etc.). I’d be curious to see how the Rhake would function with smaller camera inserts like the Topo Camera Cubes. 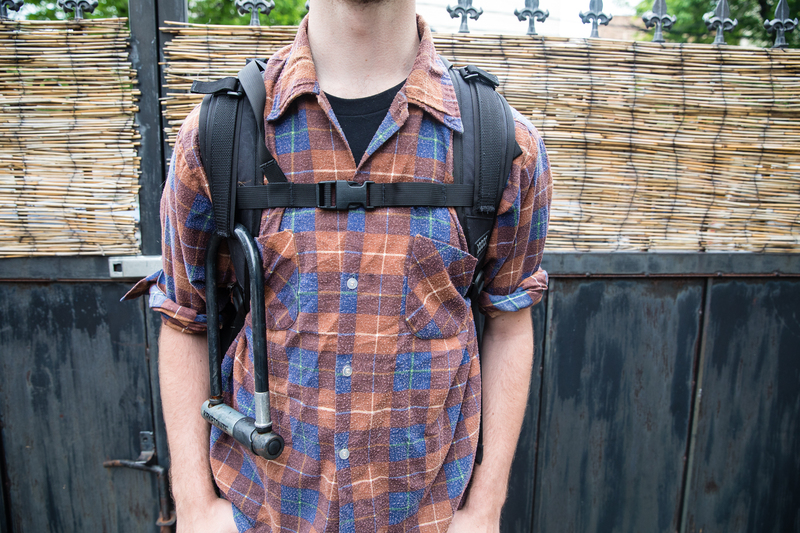 The Rhake’s construction is high quality, the design is aesthetically pleasing and it can hold a good deal of gear without looking bulky, making it great for everyday use. But the bag is pricey and the multi-functionality aspects make certain elements of the design inconvenient for photographers. 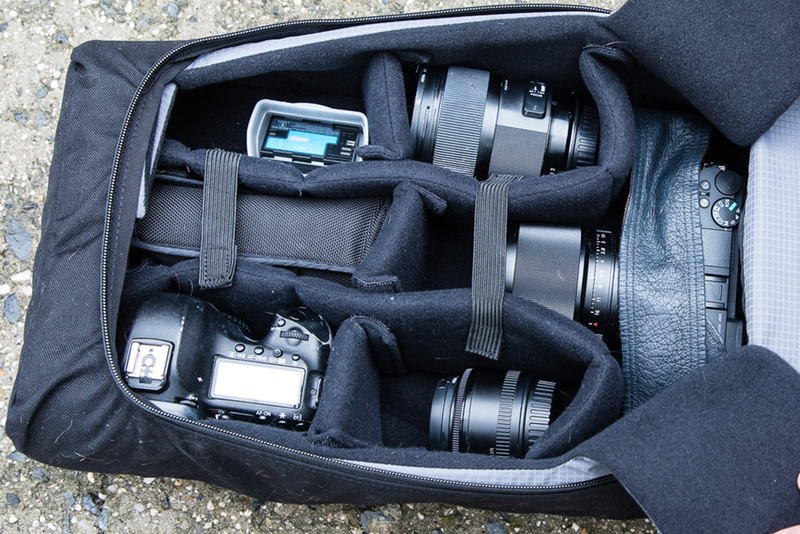 Ultimately, if you’re looking for a dedicated camera bag, there are other more cost-friendly and functional options out there. 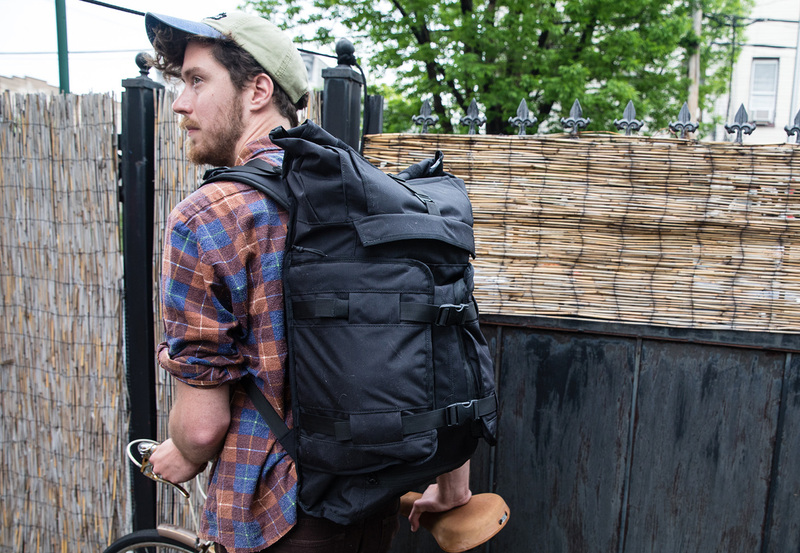 However, if you want a pack that can pull double duty as a bike bag or a weekend travel pack, the Rhake might be for you.